It’s a pretty rare sight to see Norodom Boulevard clear of traffic on a weekday morning. It’s even rarer to be hard-pressed to find a tuktuk in a city overrun with them on normal days. But it’s the Pchum Ben holiday, and during this time, everything shuts down in Phnom Penh. While there are a handful of expat restaurants, cafés and neighborhood shops open to capture the remaining few patrons, any visitor to Cambodia during this time would think the country was closed for business. This week is not about the living. It’s about the dead. It’s a 15-day celebration (culminating in the big three days this week) where Cambodians pay respect to their ancestors, travel home to family provinces and make early morning or evening pilgrimages to the pagoda to deliver food and prayers. 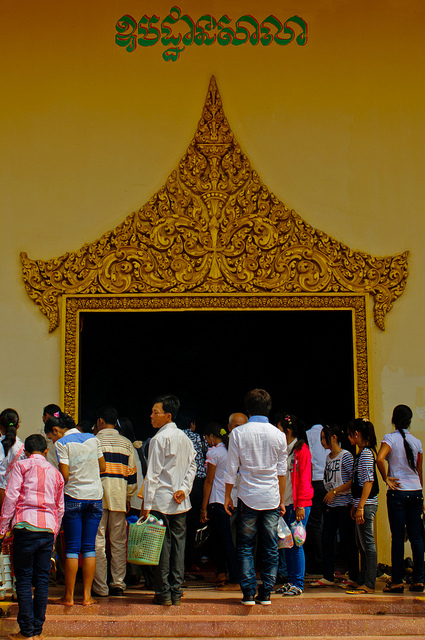 It’s the time, according to Cambodian tradition, when the gates of hell are opened and the ghosts of the dead are particularly active. So people gather en masse at pagodas in their home towns to pray for their departed loved ones. The belief is that these ancestors are trapped in the spirit world and their descendants need to bring offerings of food and money to help them move on. Pagoda visits usually happen very early as Cambodians believe most souls are afraid of sunrise and more likely to wander around during dawn or early in the morning. It is believed that wandering spirits look in seven different pagodas, and if they don’t find their living relatives in any of the pagodas, they will curse them because they can’t eat food offered by other people. When the living relatives offer food to the spirit, the spirit will bless them with happiness. The festival of Pchum Ben is based on the principles of karma and reincarnation since, while most people are believed to be reincarnated at death, those with bad karma can be trapped in the spirit world, unable to be reincarnated. At this time, these souls are released from the spirit world to find their living relatives and repent. It’s a time of family, prayer and remembrance. And, as with most occasions in Cambodia, it’s also a time of food. Visit a pagoda during this time and you’ll see dish after dish of food prepared for the monks. You’ll find bunches of bananas, sticky rice balls, cakes and desserts wrapped in banana leaves. It’s a veritable feast for the senses. 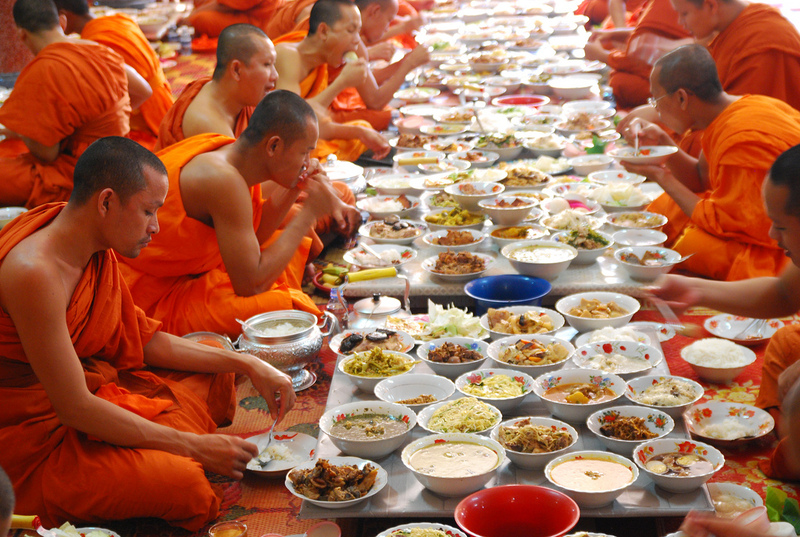 It happens this way because most Khmers believe that preparing food for monks is an act that transfers merit to the hungry ghosts, and many believe that food itself is transferred from the monks to their ancestors. Some believe that during Pchum Ben, food offerings are transferred directly to the dead so you might even see people throwing sticky rice into fields for the ghosts. While it’s a joyous and colorful celebration, the downside is that a number of people are unable to afford lavish gifts and food and, there tends to be an escalation of crime around this time. The first day is called Ben 1 (Ben meaning in Khmer “to collect”); the 14th day is Ben 14 and the 15th and final day is Pchum Ben day (Pchummeaning “to congregate”) marking the end of the festival. That‘s the time when the dead ancestors are ordered to return to hell, and the last time they will be heard from until Pchum Ben rolls around again next year. Previous PostIntroduction to the Philippines Next PostWhere to Stay in Bandung?